David Cameron is the only party leader who signed that pledge in February still in his job, but both Clegg and Miliband’s successors have echoed the sentiment and there’s apparent cross-party consensus that climate change is a serious problem that requires action. But while that consensus is a great advance on what came before and produced the Climate Change Act, it masks the reality that political commitment to climate change is weaker than it now needs to be. For a politician or commentator, saying you want strong action on climate change has become a form of virtue signalling: showing off your supposed commitment to tackling a future, widely-recognised and scientifically-backed worldwide threat that will most hit the poorest and future generations (who generally aren’t your electorate) – all without needing to make any difficult decisions. You might think I’m having a pop at the government here, and in part I am. Despite Cameron’s February pledge and the election manifesto, which supported the Climate Change Act, the first few months of this government have produced a string of cuts and reversals that look set to undermine efforts to reduce emissions. At the same time, the government has maintained an official commitment to meeting our climate targets. That’s become well known and a target of campaigners’ anger. But what worries me just as much is the less obvious loss of seriousness about climate change among the kind of people who had previously been its strong allies. This has become clear with the approaching decision on airport expansion. As I’ve argued, expanding our airport capacity would mean either hugely ramping up ticket prices to cut demand and meet our climate targets or keeping prices constant and failing to meet our targets. Since it would be obviously stupid to build a huge new runway and then direct policy to make sure that new capacity isn’t used, it’s pretty much inevitable that building the runway would mean we don’t achieve our targets. This is the first really hard climate change decision a UK government has ever had to make – and it’s exposing the thinness of many people’s supposed commitment to tackling the problem. If it weren’t for the climate problem, I would be tempted to back the runway. It’s true there are some other good arguments against expansion, like whether we really need more capacity, and the effect on local air and noise pollution (so maybe build at Gatwick instead). But clever people say it would produce jobs, make the UK more competitive and bring affordable holidays in reach of more low-income people. But, we do have that climate problem and I haven’t seen anyone offer a serious way of reconciling expansion and our targets. The Davies Commission’s proposal obviously wouldn’t work, so in reality expansion means giving up a serious expectation that we will meet our target (you might hope for a technological breakthrough, but bear in mind the Davies Commission already relies on this with its implausible ticket-hiking plan, so you would need an even bigger deus ex machina and no serious analyst is predicting this). And yet, many people who signal their climate virtue also support airport expansion. Brits worried about climate change have reasons to be pleased. Our emissions fell last year, global emissions may be turning around, and the Tory government has a new Energy Secretary in Amber Rudd who seems genuinely to care about climate change. But with the Lib Dem green handbrake gone from government, the UK’s emissions cuts are under attack and may well be facing a greater threat now than they have any time since reducing emissions became government policy. Now, the principal line of attack is one that people worried about climate change often don’t seem to take seriously, perhaps because it’s not one that comes from clichéd right-wingers. Instead of critics opposing climate policies because they, supposedly, hurt business or growth, the argument is that climate policies directly hurt the poor. This week the Spectator’s editor, Fraser Nelson, made that case. The logic of Nelson’s argument is that squeezed households of the UK shouldn’t pay more to address climate change than their equivalents in other countries, and that taxpayers’ money shouldn’t be wasted on subsidising inefficient green schemes like biomass boilers. Nelson is respected and influential and you can see the appeal for a Tory government that will increasingly try to occupy the political centreground up to the 2020 election. One implication of this for green policy has already emerged with the plan to curtail the Renewables Obligation subsidy for onshore wind. Since this is the cheapest form of green power, and, if Nelson’s argument wins, it couldn’t be replaced with more expensive forms (tidal barrages, offshore wind etc), the only option seems to be going all out for fracking in the hope it’ll be a success and bring down costs in the short term. Fracking probably wouldn’t breach our climate targets until after 2025, by which time ministers in the current government will presumably be gone so won’t have to face the consequences of that breach. But such decisions made now – in the name of protecting the UK poor from the costs of energy policy – would make it much harder and more expensive to get back on target for 80% cuts by 2050. A similar argument is also made by the right about the supposed costs of climate policy for the world’s poor. It holds that the pursuit of renewable energy, being more expensive than fossil fuels, is slowing down development and so doing harm in poorer counties. Use of developing countries’ land to grow biofuels is criticised on a similar basis. The logic of this is, again, that the focus in these countries should be on reducing poverty rather than emissions (ironically, some argue against emissions cuts in rich countries on precisely the (false) premise that poor countries aren’t cutting their own emissions – the two arguments together would amount to no-one ever cutting emissions). The challenge for people worried about climate change is that these critics are onto something. Poorer households in high-emitting countries shouldn’t pay more to limit climate change if wealthier households can pay instead. We shouldn’t be prioritising spending taxpayers’ money on poorly structured subsidies for green heating of rich people’s homes. And the poorest people in the world certainly shouldn’t see slower development and less secure access to food than they would if their countries followed a high-emitting path to development. Climate policy advocates already make some arguments to address all this. An IPPR report this week showed how subsidies for renewables should be restructured to avoid costs falling on poorer households. And the international arguments are easy to refute: no-one I know of now advocates biofuel use if it threatens forests or food supplies, and renewable energy projects are subsidised internationally so they don’t cost more than plants that burn fossil fuels (although even then, we should indeed look at whether the subsidies could be better spent on development, particularly to increase resilience to a more unstable climate, with greater emissions-reductions coming from wealthier countries). But still, those arguments aren’t yet sufficiently developed by people worried about climate change, nor are they made often enough. Increasingly, it is people arguing against emissions cuts who claim to be on the side of the poor – campaigning against environmental activists who are presented as blindly pursuing climate policies with no regard for their cost. It’s becoming the soft underbelly of climate policies, vulnerable to attack in the way the earlier battlegrounds (climate science, feasibility of emissions cuts) no longer are. While there’s much to cheer in the UK’s efforts to reduce emissions, people worried about climate change need to recognise that the arguments have moved on. The new attacks are putting them in danger of being cast, absurdly, as the ones who don’t care about the poor – and giving an excuse for the watering down of the successes of the last decade. The Pope’s encyclical will, apparently, tomorrow warn that we need to make significant changes if we’re to avoid “unprecedented destruction of the ecosystem”. Despite many reservations about the people who run the Catholic Church, it would be silly of those of us worried about climate change not to welcome Pope Francis’ intervention. 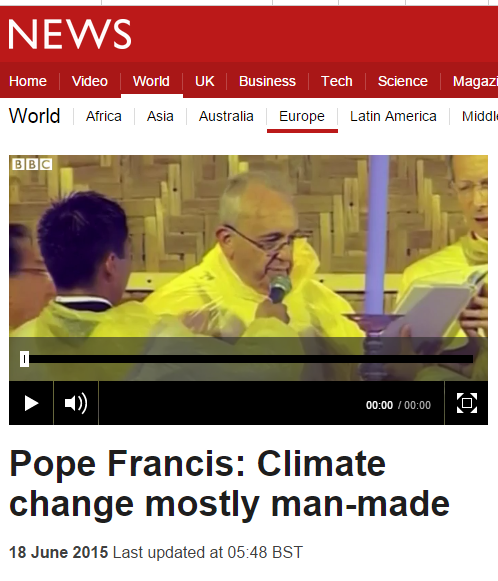 But I think the encyclical makes one important mistake. According to the leaked draft, the encyclical will say: “Numerous scientific studies indicate that the greater part of global warming in recent decades is due to … human activities”. From a communications perspective, raising the question of whether or not climate change is real makes very little sense. By bringing up the question of human contribution, the Pope is drawing attention to and prolonging a debate that shouldn’t exist on the scale it currently does. Climate scientists overwhelmingly think current warming is principally or entirely due to human activity. There’s no serious doubt about the link – and only very small numbers of people (outside America) think climate change is a hoax. But some of those who want to stop action on climate change have long sought to fabricate the existence of a debate about whether or not human activity is the cause. By engaging with this debate, even to take one side, the Pope is legitimising it and wasting time that could be spent talking about why it matters. He’s far from alone in this. The first report of the Adaptation Sub-Committee starts, “The overwhelming majority of experts agree that the global climate is changing, and that most of this is caused by human activity”. And the worst culprit is the IPCC, whose Assessment Reports are timed so the lion’s share of the coverage goes to the one that says, essentially, “Scientists still say climate change is real”: the most predictable missed opportunity in climate communications. By way of comparison, suppose a government white paper outlining a ban on smoking in indoor public places started with a line that scientists indicate lung cancer is often caused by smoking. It would create the false impression of there being a debate (why else would they need to say it? ), where there is none (at least, not one that need consume media and public time since the opposing view is so overwhelmed by the evidence). And suppose the coverage ran: “Government: smoking causes cancer”. We would see it for what it is: a waste of our time. Heathrow or Gatwick expansion makes it much harder to meet our climate targets: so why no Option 3? Posted in Climate Sock, London, Transport on June 6th, 2015 by Leo – Comments Off on Heathrow or Gatwick expansion makes it much harder to meet our climate targets: so why no Option 3? The debate about UK airport expansion has been framed brilliantly by the pro-expansion side, at the expense of climate change. The Airports Commission is expected to publish its report on London airport expansion this month – recommending a new runway at either Gatwick or Heathrow. As things stand, we can only meet the UK’s 80% emissions reduction target if our aviation emissions in 2050 are no higher than they were in 2005. This could allow for a 60% increase in flights, balanced by improved efficiency and use of sustainable biofuels. That assumes a cut of 85% in emissions from other sectors: the Committee on Climate Change have said they don’t think it’s plausible to count on even greater cuts to balance higher emissions from aviation. Yet, the Department for Transport’s UK Aviation Forecasts predicts that, even without airport expansion, passenger numbers will more than double by 2050 and emissions will hugely overshoot the target (about 40% above the 2010 level). It suggests that, if it isn’t constrained by airport capacity, UK aviation would be about 10% greater (I was surprised by how little difference there is). So even without expansion we appear to have a problem with reconciling flying and meeting our climate targets. Expanding our airports will make this problem even harder. And if we do expand in the South East, there will be even less chance to expand elsewhere – hardly boding well for a rebalancing of the economy. But that challenge is barely being talked about in the debate about airport expansion. This, I think, is down to how well the debate’s been framed by those who want expansion: the question is whether we should expand at Heathrow or at Gatwick, not whether there should be an option 3 of not expanding at all. I’m reminded of Damian McBride’s observation that the up-side for Labour of the Blair-Brown battles was that the media focused on those and ignored the Tories. The entire focus of airport expansion coverage (and polling) is now on the question of where, not whether. Similarly, the way the environment is discussed has been framed in a way that helps the pro-airport side. Gatwick’s marketing talks extensively about the environment, by which they mean local noise and air pollution. 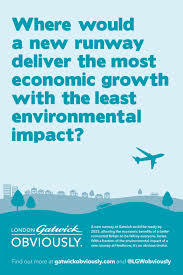 Climate change is typically treated by the media as an environmental (not an economic or social) issue, so Gatwick’s framing of the environmental impacts as local, rather than global, means that climate change is pushed off the table: there’s only so much time the media can devote to a ‘niche’ issue like the environment. Together, this means the debate’s been framed as a battle between Heathrow and Gatwick, while the environment is a metric by which their local impacts can be judged. Probably as a result of this, there’s been little recent polling on whether or not people actually want a new runway. The latest I can find is from Opinium’s poll for Carbon Brief in January 2013, which had 39% supporting an increase in flights from the South East, 16% opposing, and 45% in the middle or don’t know. While it doesn’t point to much opposition, there doesn’t seem to be a great deal of enthusiasm either. It suggests an effective opposition movement could do a lot to shift public opinion: much as the XL Pipeline protests have in the US. But they’d need to start with the recognition that their side of the debate is currently not recognised as valid. Nevertheless, there’s an enormous challenge of expanding airport capacity while meeting our legal climate targets, and public opinion appears still to be largely undecided about expansion. Given that, it’s strange that the debate has been so limited.